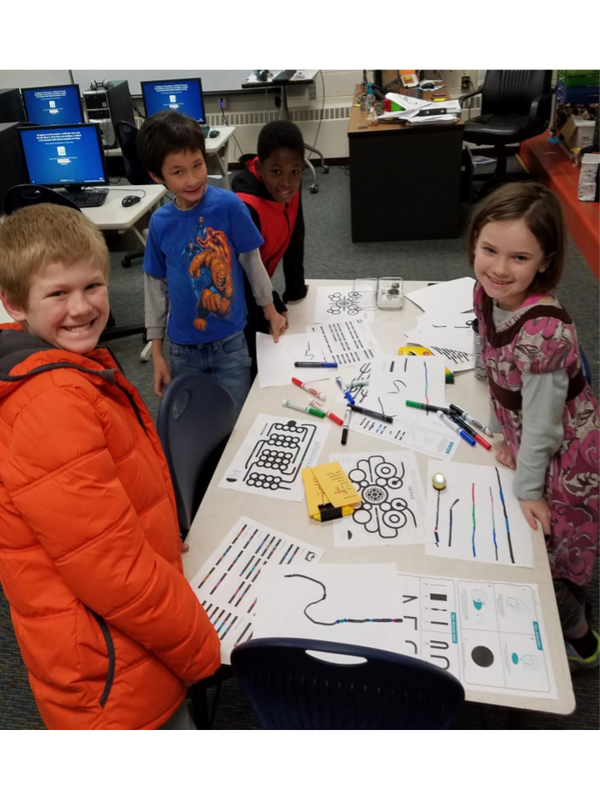 Help my students and me celebrate Computer Science Education Week (December 3-9) by helping us fund Ozobot Evos. A few years ago, I purchased two Ozobot Bits to use during Technology Class. Since then, I have been using two Ozobots to teach programming skills to my Kindergarten thru Fifth grade students. As of this post, we have 339 students enrolled. That is 339 students to share two Ozobots. Out of all of the programming activities we do throughout the year, the Ozobots are by-far, the most popular. Evvolve, the creators of the Ozobots, have a classroom set of 18 Ozobot Evos and other classroom accessories. I would love to raise money to order an "Evo Classroom Kit," so that every student gets a chance to program and explore an Ozobot! Below is the description of the kit. 150+ STEAM Lessons – Discover K–12 lessons on STEM subjects & beyond (including art, history, & more!)" If our goal is not met, I plan on purchasing as many Ozobots and accessories as we can afford. If we are unable to fund this project completely, I will also research other hands-on programming tools for students K-5. In addition to this PledgeCents page, I am also submitting an application through my school district for a mini-grant worth $250. My sister, Laura, also shared an Instagram post from actress Kristen Bell, who chooses a teacher each week to receive a donation to their classroom and school. This is called #FeaturedTeacherFriday. I emailed a submission and realized that I put a lot more thought into that email than into this website. If you donated to this cause, then you know me. I HATE having a pity party for my students. They are strong, they are resilient, and they are smart and kind and I love them. But...that doesn't mean some of them don't face some challenges. Here is my email. "My name is Ashley Hufnagel and I am a Y5 (Young Fives) though 5th grade Technology Teacher in Kalamazoo, Michigan. I work for Comstock Public Schools and am currently teaching at Green Meadow Elementary. We are located right next to a corn field. Here is some information about my students. At Green Meadow, we fluctuate between 90-90% free and reduced lunch, and many of our students live in poverty. The majority of the students don't have Internet or computers at home. We are trying to raise about $1,500 for a class set of Ozobots, which are little programmable robots made for learning computer programming. They are small tool with powerful potential. Right now, I have 2 Ozobots, that I use to teach the 340 students at my school. It would be amazing if we could raise enough money for a class set of 18 so that ALL students have the chance to create and innovate. Each student at Green Meadow would be affected greatly by this gift. In addition to poverty, many of our students have witness and experiences trauma. For example, over the last year there have been two shootings that directly affected multiple students, as well as a high-presence of drug-use. It is my goal to use engaging resources, like the Ozobots, to help keep students focused and interested in Computer Science. My goal is to give my students the tools to help their families out of poverty. The reason I want to bring Ozobots into their hands is to help close the "Technology Gap" or "Digital Divide" that these students experience through poverty. Here is a video we created to share with potential investors, https://youtu.be/9chKh4RsUqw, and I've attached some Slides to show you how I've tried to engage my students (https://docs.google.com/presentation/d/1qmjPeSiX4R_AjU__Lkscq9YNNaPJSrP8aHs_ob8amWo/edit?usp=sharing). The only item on our Amazon Wish List is a class set of 18 Ozobot Evos and their accessories (link hidden). Full disclosure, I am in the process of fundraising for this set, but our chances are looking slim. Before I saw your post on Instagram, I created a PledgeCents crowdfunding fundraiser for Ozobots. Here is the link to that project, https://pledgecents.com/cause/mjkvkl/learning-programming-with-ozobots. We have met 18% of our goal, with most of the donations coming from my family. I am super grateful for everyone's donations, but it doesn't look we'll have enough for the class set. Thank you for taking the time to read this email. My students mean so much to me, it was hard to condense this into one email." Please share this cause. Today we can receive a $200 gift from PledgeCents if we have enough shares! We have reached 18% of our goal and have 5 days left! Today is #GivingTuedsday, and PledgeCents is having a competition for all causes on their website. Here are the details to to competition (here). Basically, all you have to do is visit the donation page and click "Share on Facebook." If our cause has the most shares, we will earn $200 for "Programming with Ozobots." There is NO NEED TO DONATE AGAIN! A Video For Our Investors! 10% of our goal! THANK YOU! We have reached 10% of our goal!!! 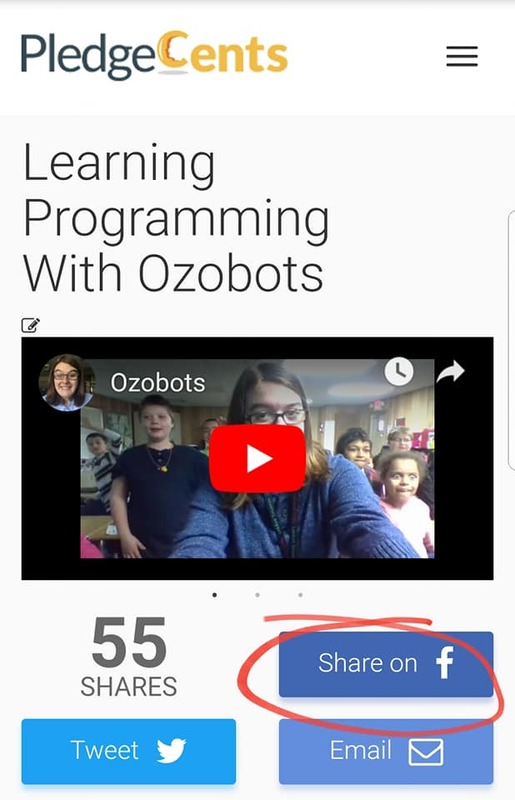 Word got out to my students that we are trying to raise money for Ozobots. I've added a video showing why they think we need them! THANK YOU SO MUCH TO THOSE THAT HAVE INVESTED IN US! $6 will cover the cost of one box of Washable Color Code Markers, for Evo and Bit. The Evo and Bit will follow the lines and complete different programs with these markers. $10 will cover the cost of the Color Code Stickers, For Evo and Bit. $100 covers the cost of an Ozobot Evo, we would like a total of 18 Evos to meet our goal!